The Gaia space probe, launched in 2013, has mapped more than a billion stars in the Milky Way, vastly expanding the inventory of known stars in our galaxy, the European Space Agency said Wednesday. Released to eagerly waiting astronomers around the world, the initial catalogue of 1.15 billion stars is “both the largest and the most accurate full-sky map ever produced,” said French astronomer Francois Mignard, a member of the 450-strong Gaia consortium. 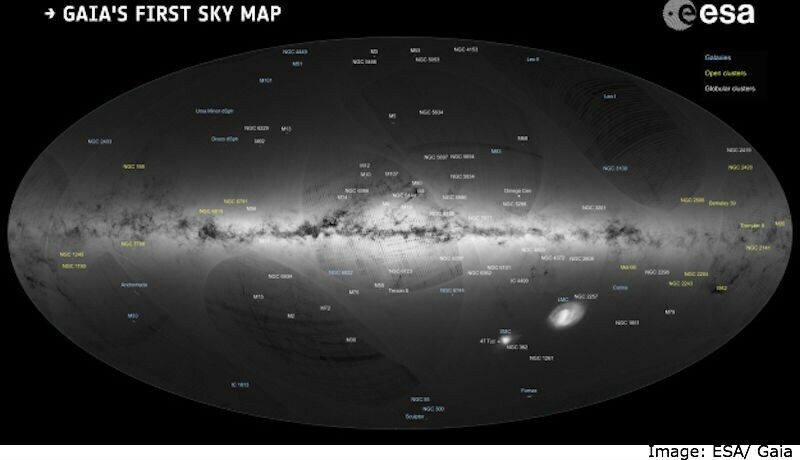 In a web-cast press conference at the ESA Astronomy Centre in Madrid, scientists unveiled a stunning map of the Milky Way, including stars up to half a million times feinter than those that can be seen with the naked eye. The images were captured by Gaia’s twin telescopes — scanning the heavens over and over — and a billion-pixel camera, the largest ever put into space. The resolution is sharp enough to gauge the diameter of a human hair at a distance of 1,000 kilometres (620 miles), said Anthony Brown, head of the Gaia data processing and analysis team. Gaia maps the position of the Milky Way’s stars in a couple of ways. Not only does it pinpoint their location, the probe — by scanning each star multiple times — can plot their movement as well. The data release today includes both kinds of data for some two million stars. But over the course of Gaia’s five-year mission, that catalogue is set to expand 500-fold. Orbiting the Sun 1.5 million kilometres (nearly a million miles) beyond Earth’s orbit, the European probe started collected data in July 2014.